Listen To The Birds Sing: Giveaway Day.... Vintage Style! This is an incredible event where you can visit lots of wonderful blogs & have a chance to win lots of incredible gifts - handmade bags, accessories, supplies, patterns....the list is endless! For more information just click here. If you have just dropped in via the Sew Mama Sew Blog you are very welcome! My name is Karen & I am so delighted to have you visiting to-day! What a fantastic giveaway. I'd love to win, thanks for the chance. Wow these are fab, never seen them before. Thanks Karen. ...and I follow you on pinterest, love your style! I love love love these - I visited the show when I was just starting to quilt but didn't buy the fabrics because I was new (and silly/stupid). I am a follower and thanks for the chance!! I love this fabric. Thanks for the chain to win. how fun is this? thank you so much for a chance to win! I am already a follower of your blog! I follow on pinterest too. I'm a new follower, and those fabrics are just so very lovely! love these fabrics! thanks. justbecame a follower! Following your blog. That bundles are just gorgeous! I am a new follower to your blog, thanks for the chance! I am a follower, I just recently discovered these amazing fabrics. You are so right, the drape is awesome!! Thanks for the opportunity!! How fun are these? Great fun. I'm a new follower and looking forward to more posts! Just signed up to follow you on Pinterest, such a fun site - love your Pins! 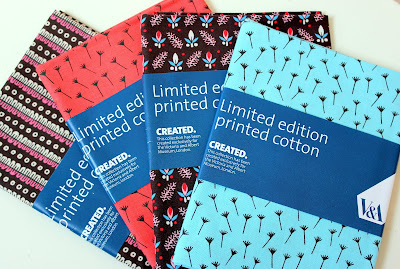 What a great giveaway - love these fabrics! I have been a follower of your blog for quite a while - love it! I'd love to win these Liberty prints! Thank you for the giveaway, Karen. It is a wonderful one. You know I am happy to be here follower. I am now following on Pinterest too. I am a new follower :) Love those fabrics!! Beautiful fabrics, what a lovely giveaway, thanks! What pretty fabric! (The top one makes my heart sing!!) I'm a follower! And I follow your Pinterest boards, too! and I now follow you on pinterest! I saw this on offer but by the time I got to the shop, they'd sold out! Gorgeous fabrics! Im a new follower, nice to "meet" you! Great giveawy, thanks for the chance to win! Thanks so much for the chance to win, gorgeous fabric! And I follow you on pinterest. OMG!! how incredibly beautiful... that fabeic is so cleanly designed. These are gorgeous, thanks for the chance to win! Never seen these before. Very nice! Thanks for the giveaway! really neat fabric. thanks for a chance. I have become a new follower because I have looked around your blog and I really like the things you do. Hmm, a comment. Well, it's getting close to dinner time! I subscribe. Thanks for the awesome giveaway. Just befriended you on facebook! Gorgeous fabrics! Im new to your blog and already love it! thank you for the giveaway the fabric is really special! I love these fabrics. Thanks for the chance to win them. I am a follower. I sent you a friend request on FB. Stunning fabrics. I am now following you. Hi Karen! Love those fabrics. Lovely fabric and fabulous prize. It wants to join me in the States. Thanks for the chance! Lovely fabric you've chosen. What a lovely giveaway! I am a new follower. These are so pretty! I'm a new follower! I am a new follower on Bloglovin' and Pinterest. PS I am also following you on pinterest! i'm a new follower via email. thanks. What great fabrics. They look so neat. Lovely fabrics. I am a new follower. I follow you on Pinterest. Great fabrics. following you on pintrest! thanks for the chance! How lovely! Different than some of the other stuff you see. Thanks for the chance to win! Followed through RSS on Google Reader! I just love finding fabulous new blogs. Thank you for the fantastic giveaway opportunity! I am a follower via Google reader. These fabrics are lovely! Hope I win. Just subscribed to your blog! 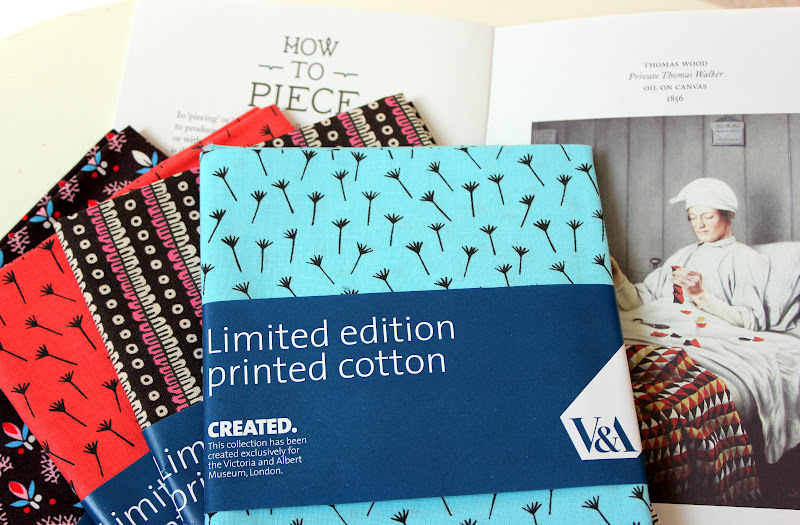 Oh my gosh I had no idea the V&A came out with fabric. I've been dying to visit that museum for years. I'm a new follower. Thanks for the opportunity to win your giveaway. New follower here. Looking forward to reading your site! Lovely fabric. Thanks for the chance. I am now following you on Pinterest too. I follow you through Blogshelf! These are gorgeous! Thanks for the chance! I'm a new blog follower! Thanks for the chance to win this cute fabric! Thanks for a great giveaway opportunity! I follow you via my wordpress reader. lovely prints. I'm a new follower. These look fantastic, and I'm really interested in that booklet! awesome giveaway, throw my name in the hat. I am a new follower. Thanks to this give away action I found a lot off new blogs. What gorgeous fabrics. Well, they would be if they are Liberty (drool) and the V&A(double drool). What a lovely giveaway. I went to the exhibition but did not buy any fabric (read.. managed to resist) so thanks for a second chance to win some! I adore those fabrics! !This is such a great giveaway! 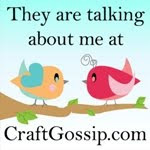 I've just become a follower, looking forward to seeing fun things on your blog. I'm a follower by email. Thanks for the chance to win. follower. i got some lovely V and A fabric earlier this year when they had a sale on meterage! What a perfect combination - my favourite museum in the world and my favourite shop in the world. what a gorgeous giveaway!! thanks for the chance! Love the seed head fabric. Thanks for the opportunity. I'm a new follower! Thanks so much for participating in Giveaway Day! I'm a new follower. I'm loving this giveaway week. So many new blogs to find and explore! Lovely giveaway! I already am a follower of your blog. Thanks for the chance to win this lovely giveaway! So pretty! I've never seen those before - thanks! Thanks for participating in the giveaway. 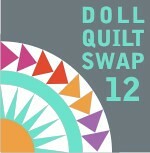 It's a great way for a new quilter like me to find new blogs! Great giveaway - I'm a follower. I'm a folower! Such pretty fabric! I love those seed prints. So adorable. I am a new follower. Thank you! I'm a new follower - I look forward to hearing more from you! I've liked you on facebook too. I'm following your blog - glad I found it! Lovely fabric, the blue one especially! Thanks for the chance at your giveaway. I am a new follower via RSS Feeds. You know I'm a happy follower! I'm a new follower, via Google Reader.